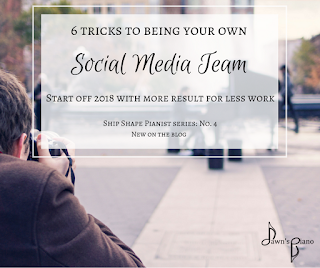 This last post in the Ship Shape Pianist series is a little different because it's for the piano teachers & small business owners out there who follow the blog. Before I dive in, I feel it is most important to say that if the idea of running your business' online presence doesn't bring you joy, outsource it. Do the things in the running of your business that you really like doing and hire someone else to do the rest. Don't burn yourself out. I think when people envision piano practice, they see you sitting down and playing through pieces beginning to end. It's a completely understandable assumption, and this is also what our students think until we teach them otherwise. The reality is that a good, effective & dedicated practice has a lot of work that isn't just playing through pieces. 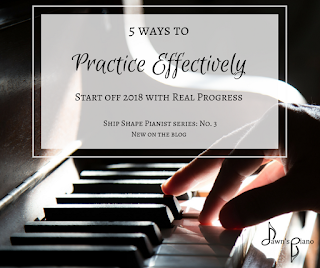 So the third post of the Ship Shape Pianist series gives you 5 tips to making your practice more effective for 2018. If you want to see some real progress in your playing, try implementing these. If you aren't sure what resources to use for any of these, just ask your teacher what they'd recommend. Ever had an entire week go by, remember it's piano lesson day, and then with horror realize you haven't opened a single piano book since the last lesson? 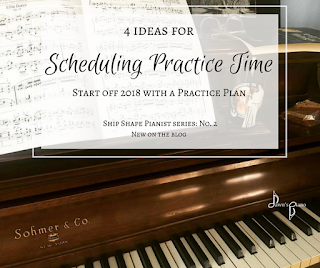 You're not alone, so in our second post of the Ship Shape Pianist series, I'm sharing 4 tips to help you schedule piano practice and stick to it. 1. Schedule a set time. Consistent practices throughout the week are much more effective than a binge practice every so often. Sit down, look at your weekly schedule, and set a regular time that piano practice will happen, even if all you can comfortably manage is a 10-15 min window a few days a week. Then stick to it. Happy New Year! And what better way to start off 2018 than some tips for organizing your practice space. 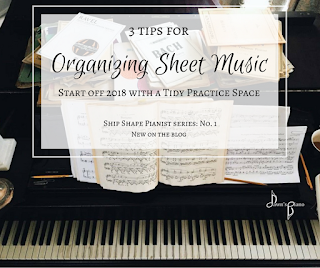 This is going to kick off a series of posts for the month of January I'm calling the Ship Shape Pianist in which I share some of the ways I try to stay organized & on schedule. (Not that I'm all that great at it all the time, but I hope that you piano parents, students & teachers out there will find something that helps you too!) So, if your piano has ever looked like the one in our photo here, I'm sharing 3 tips for keeping your music collection under control. You may have noticed that putting your piano books back in the bench after every practice can feel pointless when you know you're just going to pull them out again the next day, so stacks of music happen. They happen to all of us. And, if you think about it, practicing so often that you don't want to put your books away is a good problem to have!